For the CH2M Foundation (Englewood, Colo.), The Nature Conservancy (Arlington, Va.), and W.B. Saul High School of Agricultural Sciences (Philadelphia, Pa.), an invitation to be honored at the White House resulted from a simple idea: connect accomplished experts in the fields of environmental science and engineering with talented young people to demonstrate the value of public–private partnerships. In recognition of an inventive mentorship arrangement focusing on the disciplines of science, technology, engineering, and mathematics (STEM), the groups were celebrated as 2016 recipients of the US2020 STEM Mentoring Award in the category of Excellence in Public-Private Partnerships. 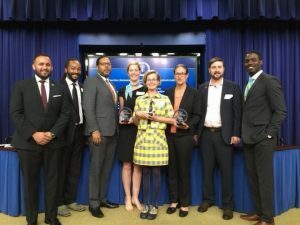 As three of more than 150 organizations that attended the annual White House STEM Mentoring Symposium held on Aug. 11, the partnership is the first ever winner of its category, which was introduced this year. Late last year, CH2M gave a grant of $200,000 to the Nature Conservancy toward the development of a green infrastructure and STEM education pilot program, tailored specifically to the W.B. Saul High School campus in Philadelphia. The project-focused curriculum will span the next 2 years, during which time CH2M engineers and Nature Conservancy scientists will guide Saul students and faculty through the construction of a large-scale stormwater management project on the 53-ha (130-ac) campus. Hands-on educational programming in water conservation will accompany other courses that will make use of on-site greenhouses, farms, crop fields, and pastures. The pilot program was lauded by US2020 arbiters for its service to more than 560 underrepresented students at the school, and for the program’s potential to scale up to the national level. “With this grant, teachers will be able to provide a true hands-on application of the agricultural curriculum that is currently being taught. The grant will enable Saul’s teachers to be at the forefront of teaching environmental technology,” said Jessica McAtamney, agricultural dean of W.B. Saul High School, in a press release. Biotechnology group Genentech Inc. (San Francisco) also won acclaim at the symposium for its work with low-income schools in Southern California to foster interest in medicinal innovation. Find out more about W.B. Saul High School’s award-winning green infrastructure program. Get a PDF with more information about the 2016 US2020 STEM Mentoring Award.